Orthopaedic Surgeon In Wantrina, Melbourne | Knox Orthopaedic Group | Knox Orthopaedic Group is a team of Wantirna-based orthopaedic surgeons. Call our practice on (03) 9887 1488 or visit our website to find out more. Knox Orthopaedic Group is a private surgery specialising in hip and knee replacements, arthroscopy, trauma management and more. 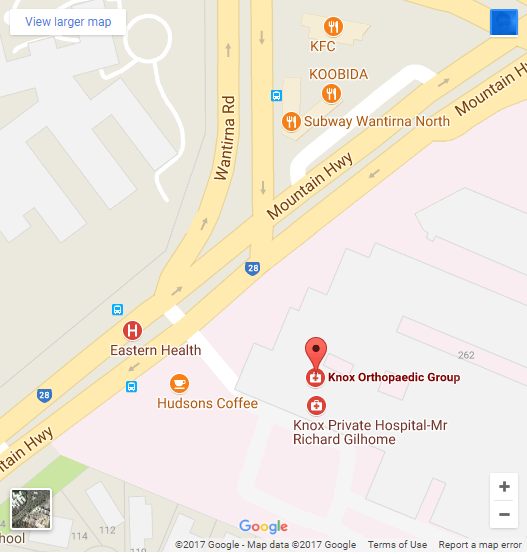 Our practice is located in Wantirna, just 35’ minutes from Melbourne CBD and adjacent to Knox Private Hospital. Our team focuses on offering a high standard of care to all our patients and their families. We understand that considering or undertaking an orthopaedic procedure can be a stressful and unnerving experience, which is why we focus on making the entire process as smooth as possible by providing you with comprehensive guidance through every step of the way. This commitment helps us reach the best possible outcome for our patients with full consideration of their needs. From the reception staff to your orthopaedic surgeon, you can visit our surgery in Melbourne knowing we are backed by years of experience and are equipped to handle any enquiries. We also have direct access to the hospital, giving us the convenience of onsite pathology and x-ray facilities. When you visit us for an appointment, you’ll receive comprehensive information regarding your condition and be informed of the options available. If surgery is required, our team places no pressure on you to make a decision and welcome follow up appointments if more details are needed. Please note that TAC or WorkSafe patients must settle accounts on the day of the consultation. Acceptance of liability is required from the relevant authority before any surgery is performed, which may take several weeks to go through. You are required to present a referral from your GP or specialist at your first appointment, along with x-rays, reports and anything else relevant to your appointment. If you would like to find out more about our services or book an appointment with an orthopaedic surgeon at our rooms in Wantirna, Melbourne, you can contact us on (03) 9887 1488. If you just have a general enquiry, please feel free to fill out our General Enquiry form.